Remember Eddie? 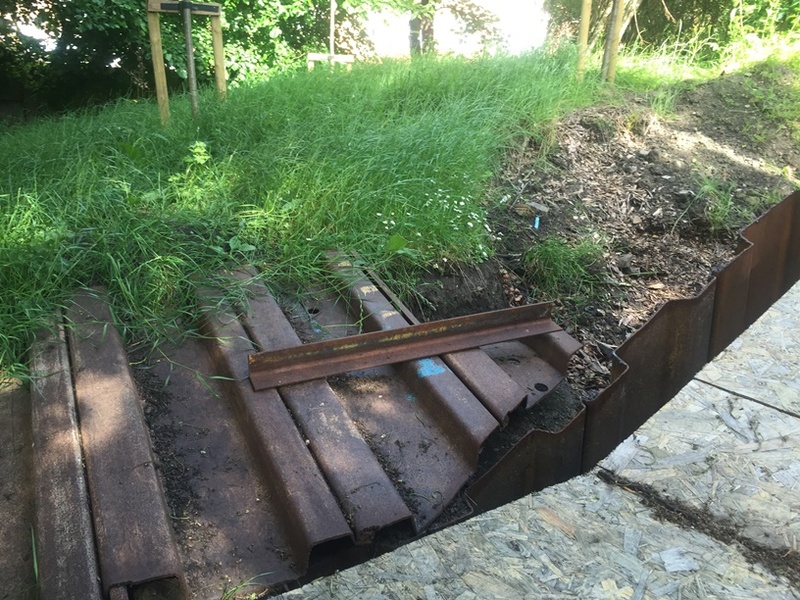 He said he might be back on site towards the end of the project when a second phase of groundworks were scheduled. We hit this point in the last 10 days of June, but, alas, no sign of Eddie: either by me from the roadside or via Giuseppe’s photos too. Shots of the new build site at the end of June show a lot of heavy work taking place – hardly surprising with only 2 months to go now. 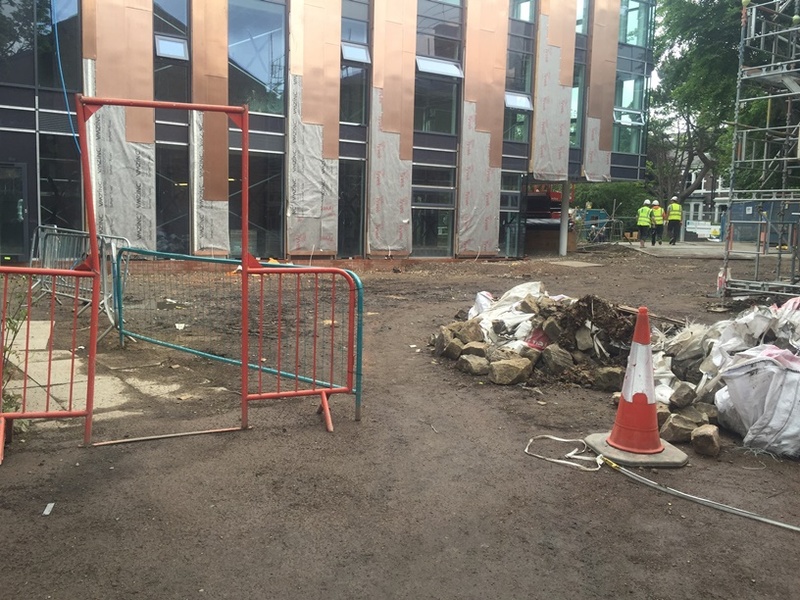 As the end approaches, a 2nd phase of groundworks begins. 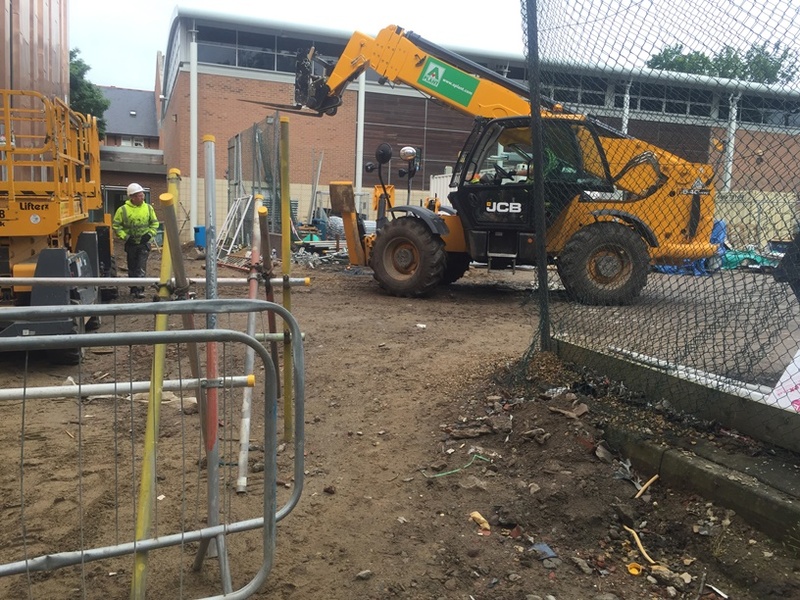 The areas around the Sports Hall seemed to be the main focus of this noisy site activity. 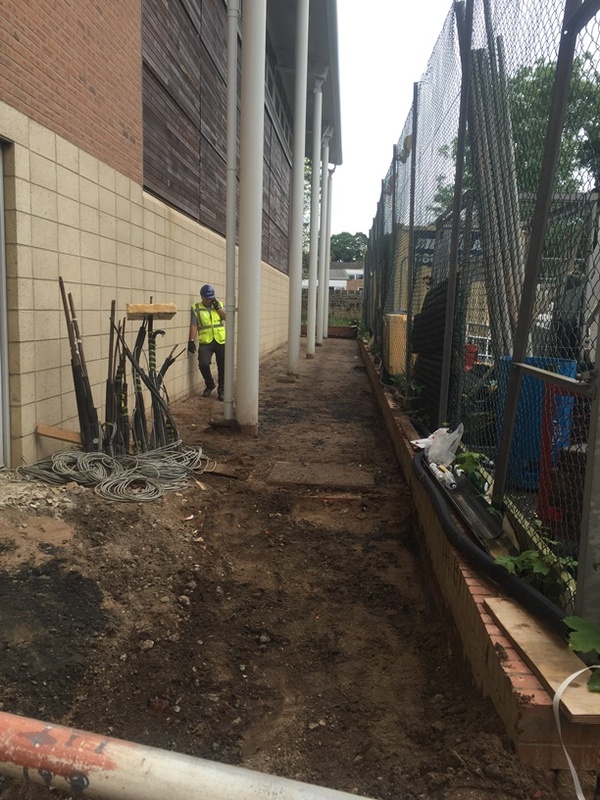 The new path surfaces were now being prepared. 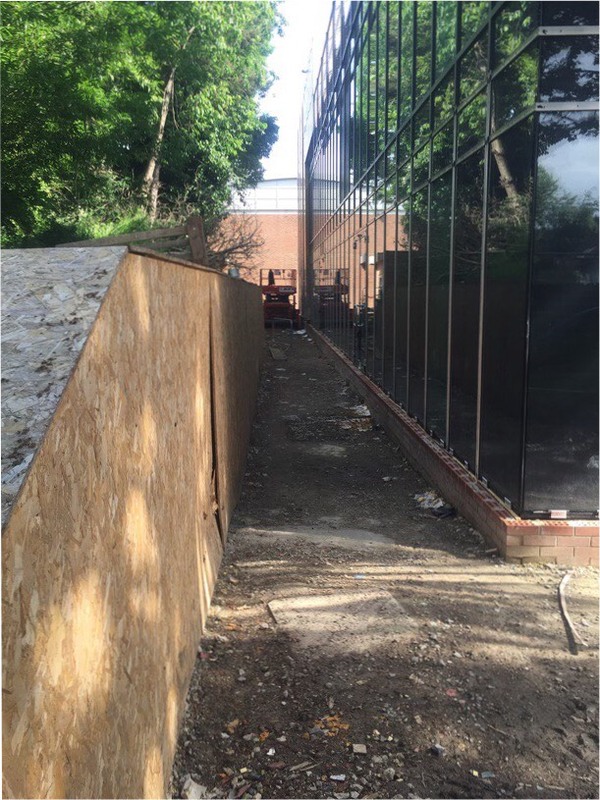 Once the heavy plant vehicles had withdrawn from the site, it was possible to see that the Sports Hall had new glass entrance doors. 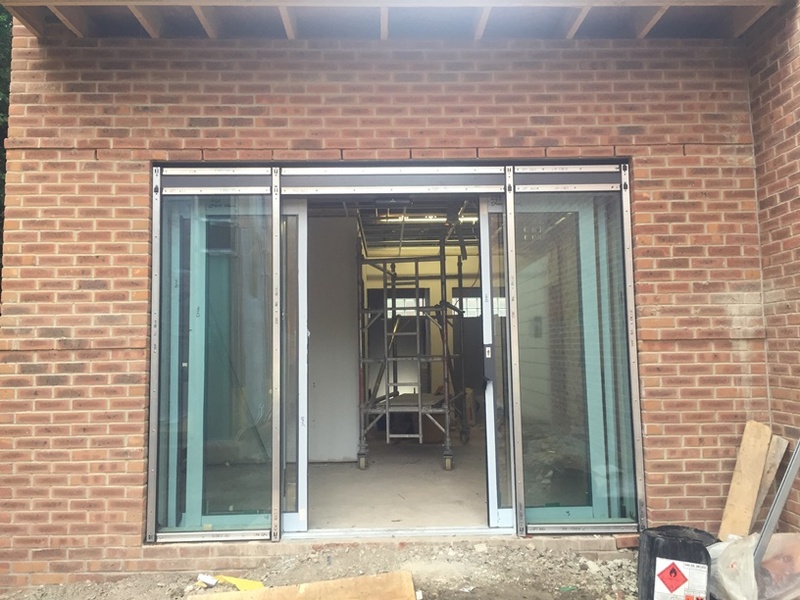 Sliding glass entrance doors have now been fitted to the re-configured vestibule area of the Tankerville Sports Hall. Along the edge of the path at the very back of the new building, an odd-looking, makeshift wall had been evident for some time now. I’d been curious about this wall for a while. Giuseppe’s close-up Clerk of Works photos explained this now. 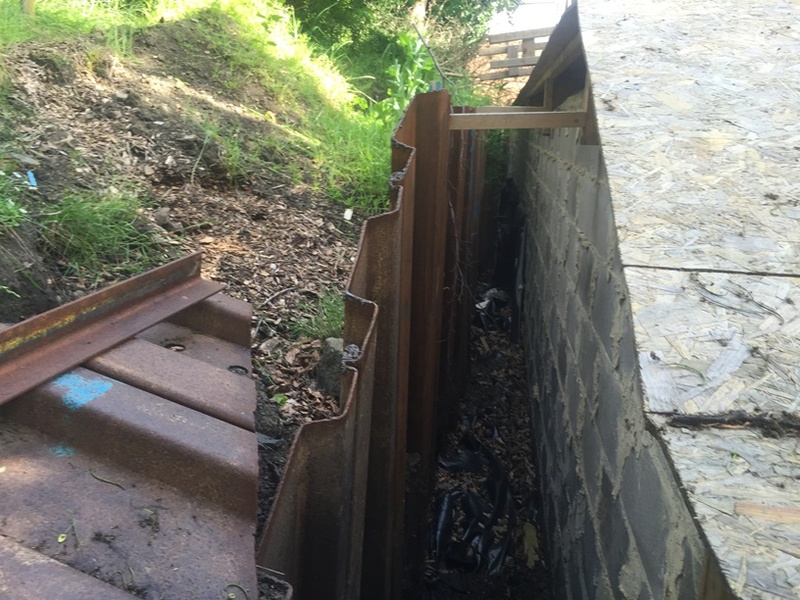 A false wall had been created to mask the iron girders which were put into place at the very start of the project to secure the embankment. These girders were the very first structure put in place onsite. 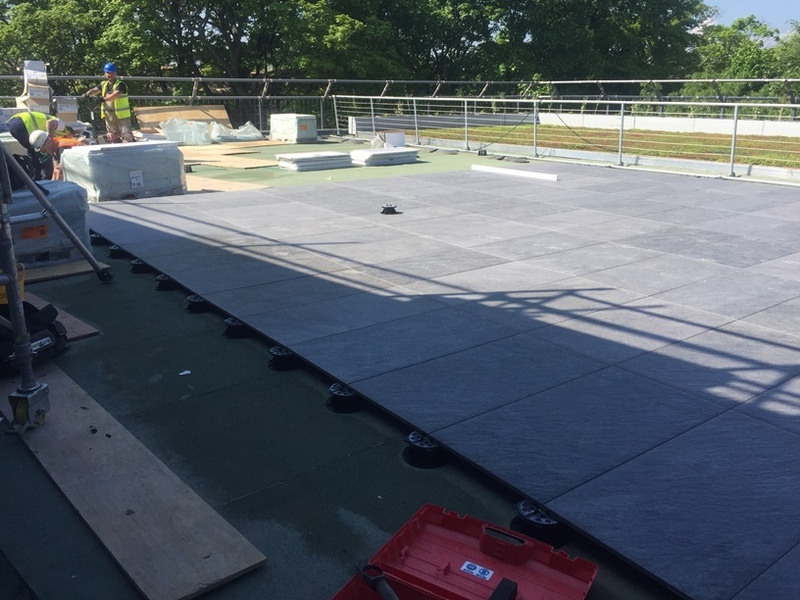 It seems a very long time ago now, but, on Topping Out Day back on February 23rd 2016, Nick White had shown me the pavement tile destined for all outdoor public areas on the new Tankerville site. In line with school colours, a light-grey, textured tile had been chosen. 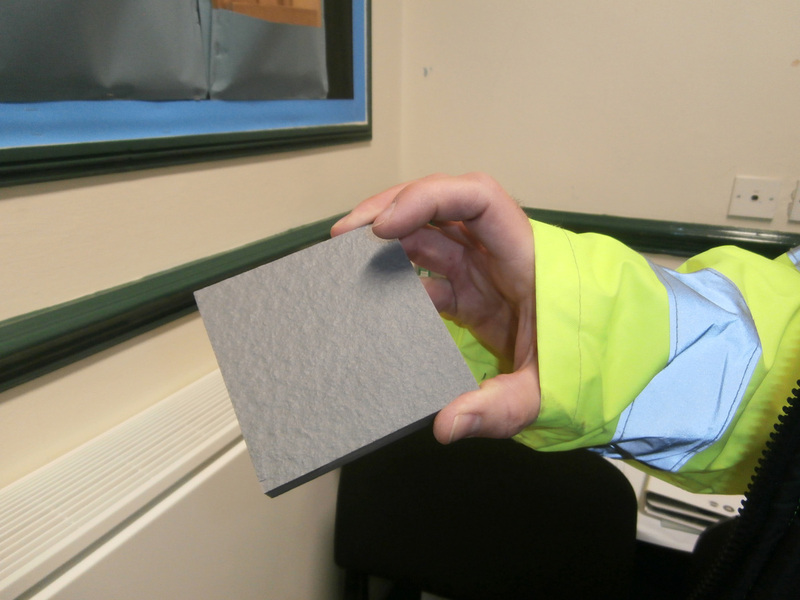 Nick shows me a sample of paving tile for the outdoor spaces. 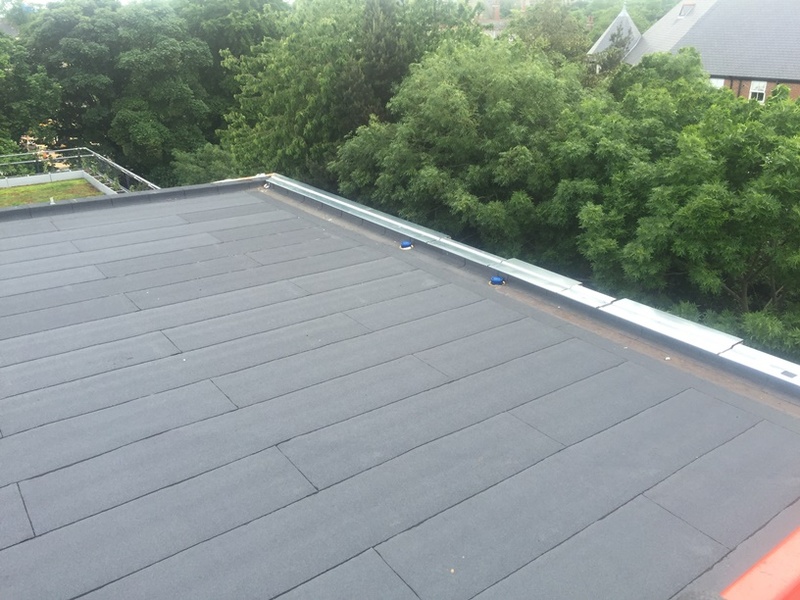 Between June 23rd and 29th, these very tiles were being laid high up on the new build’s Roof Terrace. It wasn’t a straightforward job. Paving the Roof Terrace turned out to be a tricky process. 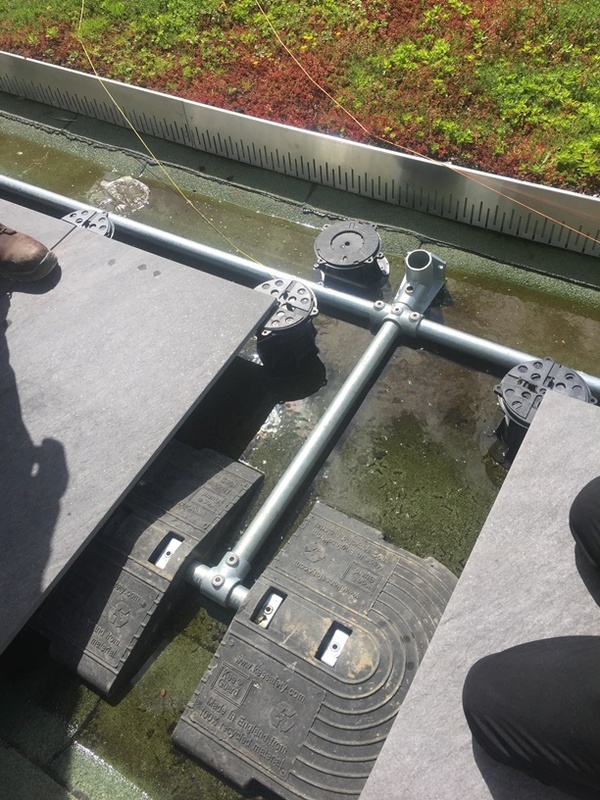 Presumably for drainage purposes and also to protect the roofing felt, the pavement of the Roof Terrace was being laid on top of supports. 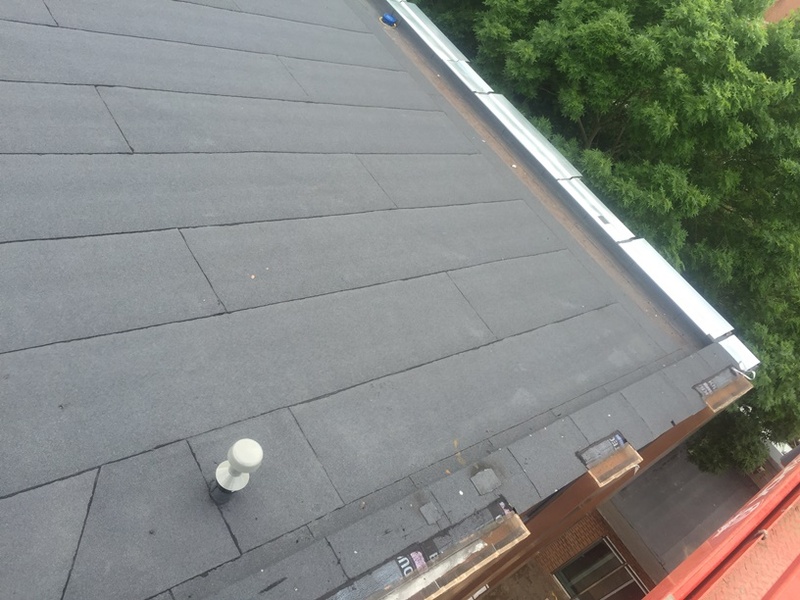 Giuseppe’s photograph below shows the Terrace paved area taking shape as it gradually works its way across to the Living Roof. If it wasn’t for Giuseppe’s kindness in securing me permission to use his site photographs for the blog, we’d all be oblivious to the fine details of many aspects of the work on both buildings. I mean, walking out onto the solid grey pavement of the Roof Terrace for the first time, would you even have considered what lay underneath you? A close-up of the last gap in the Terrace paving shows the intricate structure which supports it (above). Thanks to Giuseppe, we know what it looks like underneath too! (below). 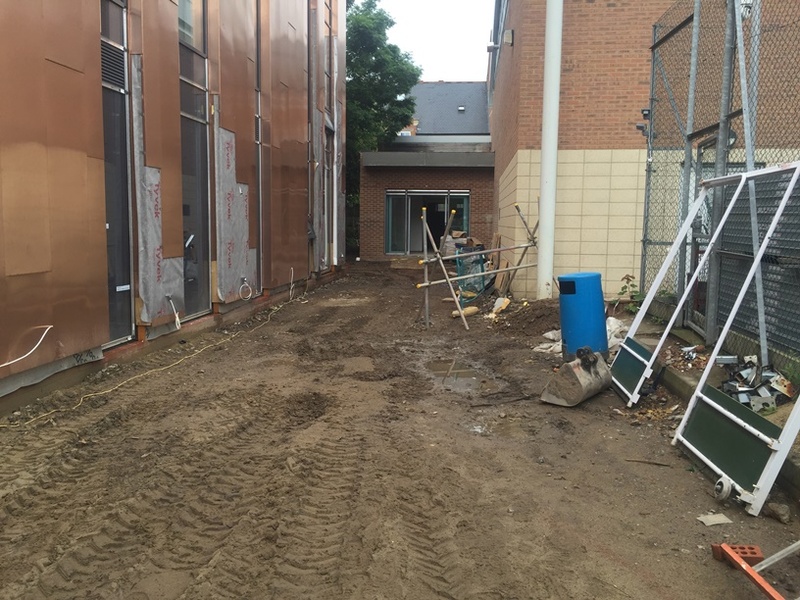 Even if I had been able to get on site at this time, none of this work would have been evident to me from the ground, of course. Peter did take me up onto the Roof Terrace when the insulation was being laid, but the new building would have been so full of workmen by now, I wouldn’t have been allowed up there. And quite rightly too. Everyone’s mind by this point was focused solely on meeting that handover deadline. Me and my camera could have got in the way. Anyway, many finishing touches were taking place at roof level now. Without the context of Giuseppe’s Flashing Schedule (above), I would’ve been puzzled by these bits of metal on the ground. 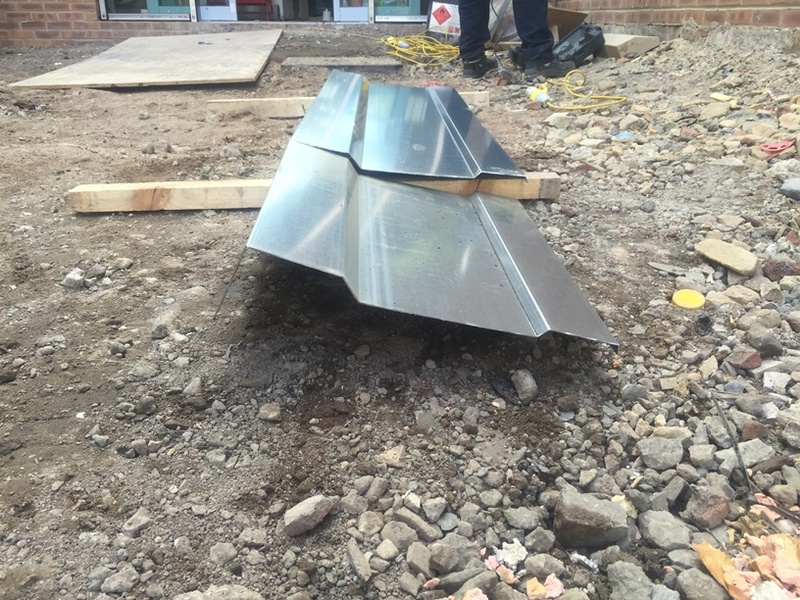 These two pieces of metal flashing were destined to be fixed onto the roof edge high, high up on the very top floor of the new building. The north edge, next to the Sports Hall, still lacks its flashing. Giuseppe’s high vantage point (presumably from a large cherry-picker) affords a wonderful view of the new building’s dual-level roofline looking towards the south. 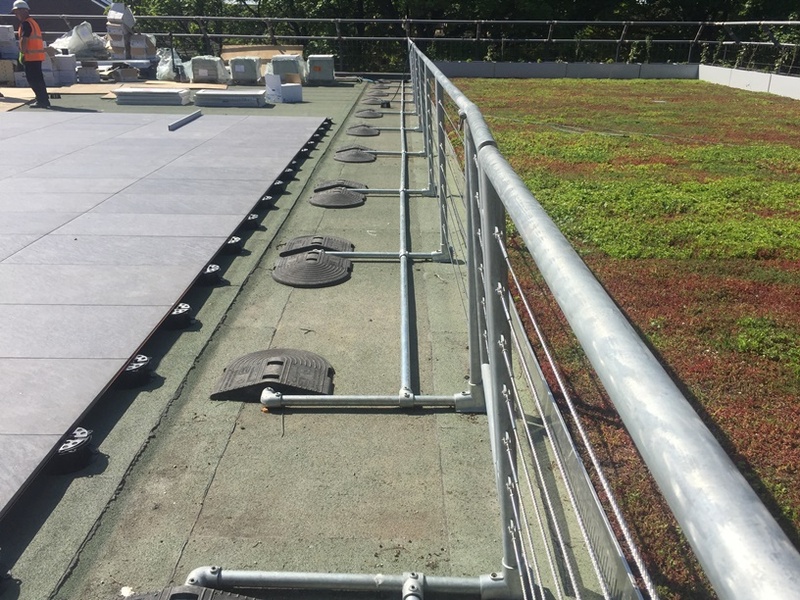 The green area to the far left of the image below is the Living Roof; the lower roof level on this western side of the new build and the positioning of the green roof adjacent to St Mary’s Court were designed with the local residents in mind. Google Analytics told me this morning someone had just looked at the post I wrote exactly a year ago to-the-day. 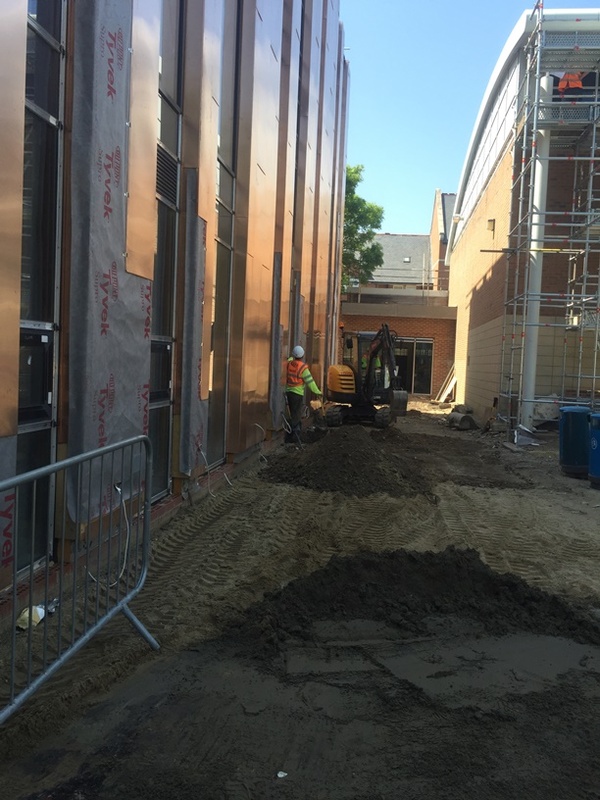 I noted it was a real-time May Day post sharing with you that the first pieces of copper cladding had arrived onsite. I’m so close to the end of the 2015-16 academic year now that I don’t want to go off at a tangent. Psychologically, I really do need to get us there. However, the events of the past week at NHSG have been so exciting, I can’t resist making just a brief reference to them here. 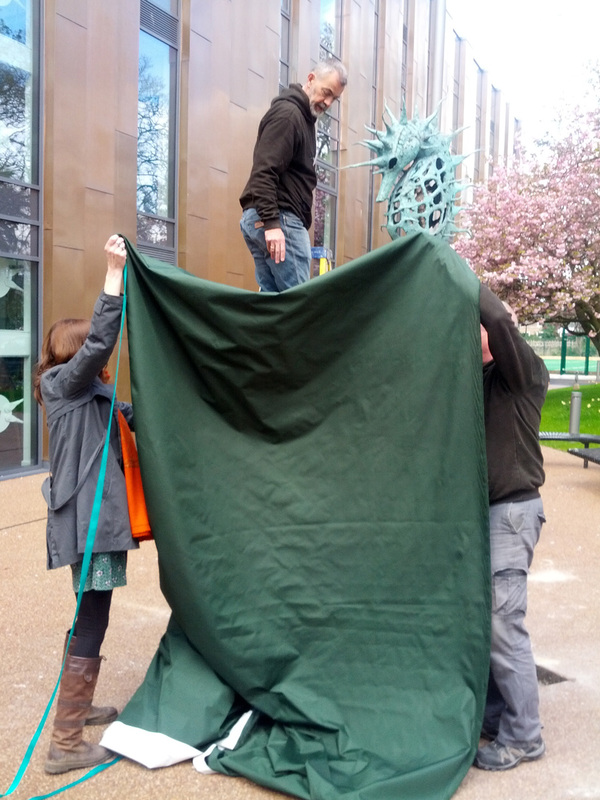 In my last post, I mentioned Zoe Robinson’s first outdoor sculpture commission had been safely delivered and installed by Brian Castor of Powderhall Bronze. Like myself, Zoe taught at Church High and now works at NHSG. She is also now a highly successful Biscuit Factory artist. 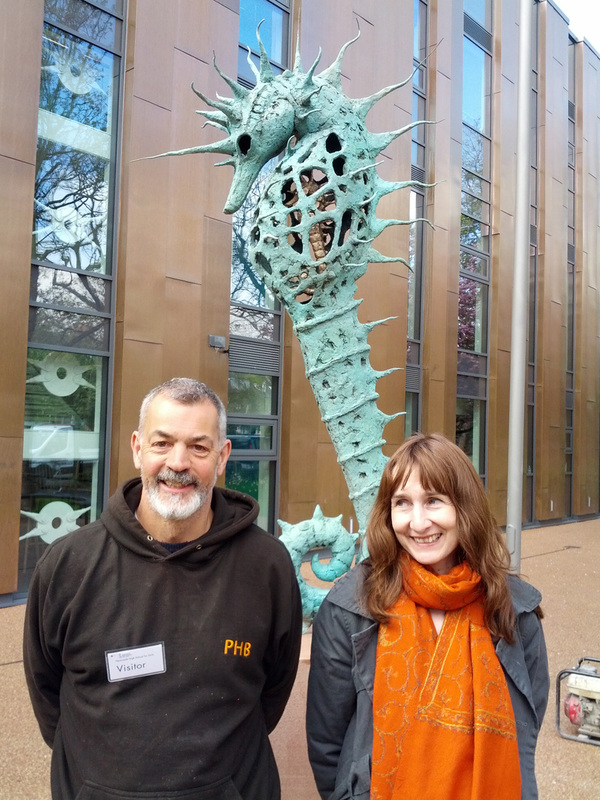 Brian Castor and Zoe Robinson on Thursday 20th April after the successful installation of the NHSG seahorse sculpture commission. 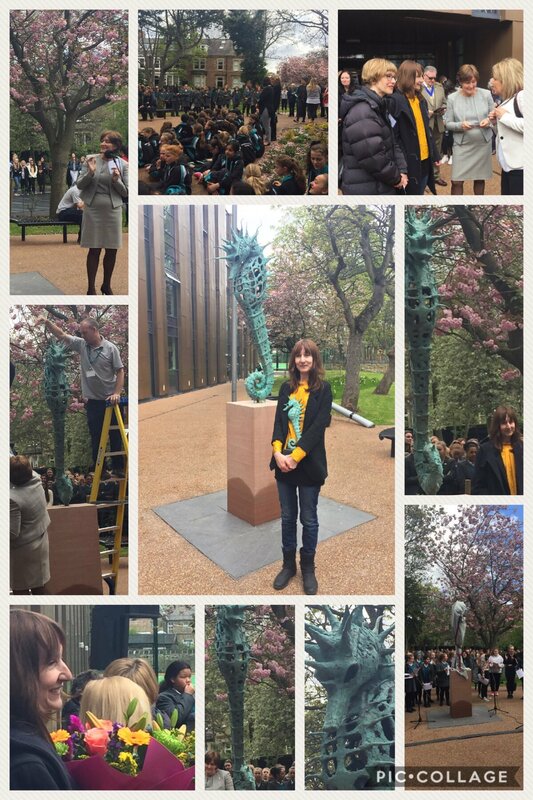 Well, I’m very pleased to tell you that last Friday (28th April), Zoe’s magnificent seahorse sculpture was duly unveiled to great acclaim. Angela Charlton, NHSG Junior School Head, tweeted this wonderful photo-collage of Zoe’s special day that evening. 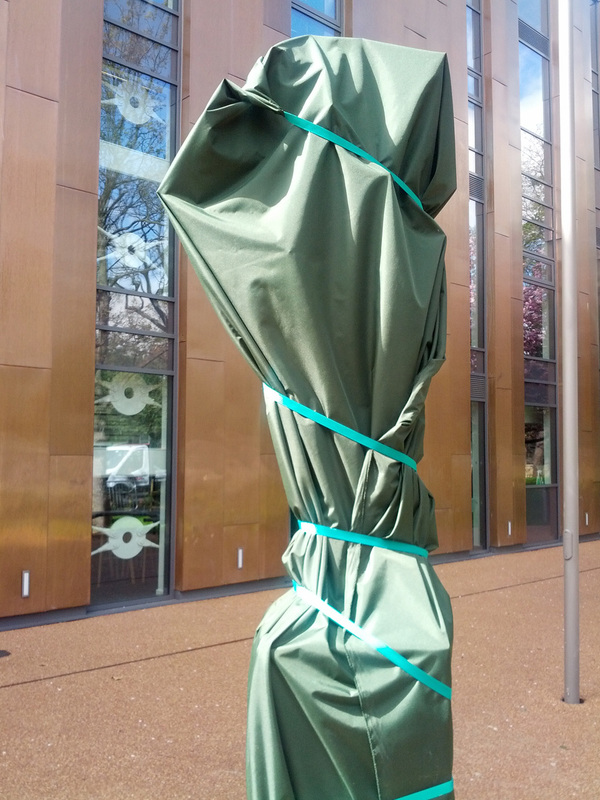 Safely secured against any prying eyes, the sculpture spent the intervening week all wrapped up like a parcel in dark green canvas. It blended in with the design of the new building so well, to be honest, it could very easily have been a modern art installation in itself. 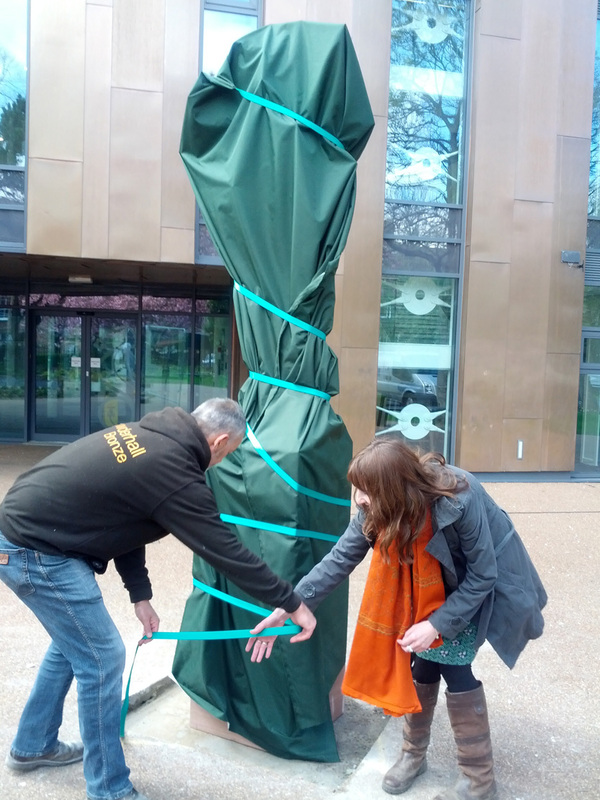 Our very own NHSG version of a Christo and Jeanne-Claude wrap art installation. 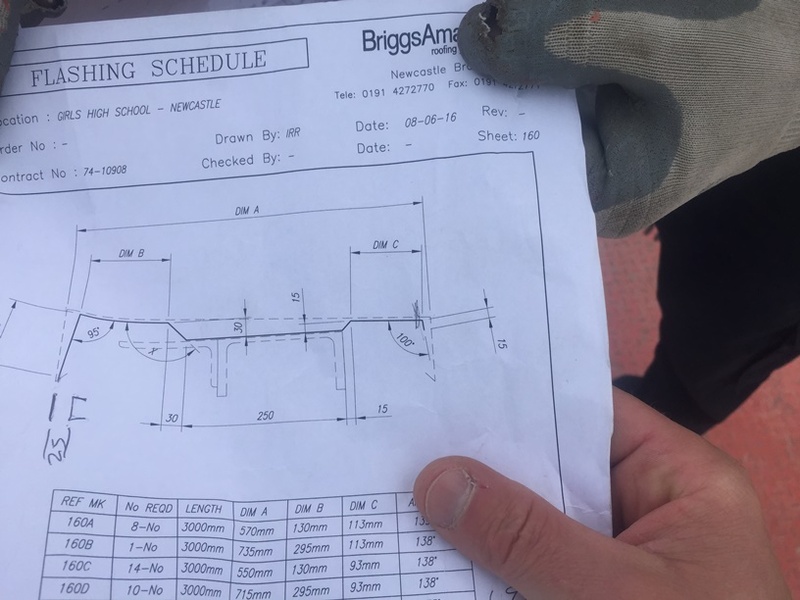 Leaving the site on June 29th, these Wates’ workers were oblivious that where they were walking over was destined for special things.